What is needed for digital success? 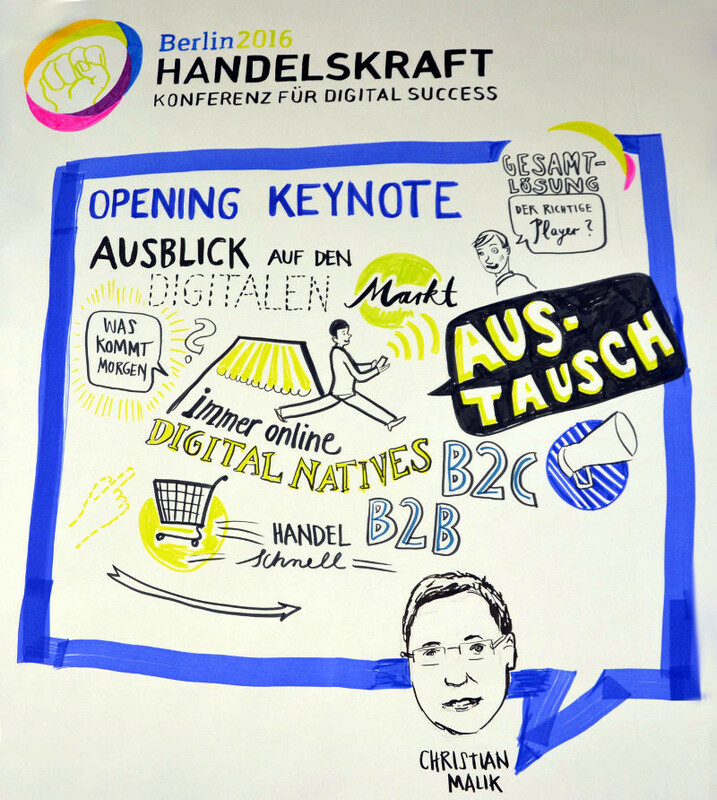 Let’s review the Handelskraft Conference 2016! The Handelskraft Conference 2016 – #HK16 – was a high-voltage event from the beginning till the end. Supported by eventtool24 an astonishing location, the Classic Remise Berlin, provided the background for our conference for digital success, combining a magical mixture of retro motors and car design classics with urban industry modernity inspiring the almost 100 attendees, and putting the perfect frame to discuss and generate interesting debates about the present and future of digital commerce. 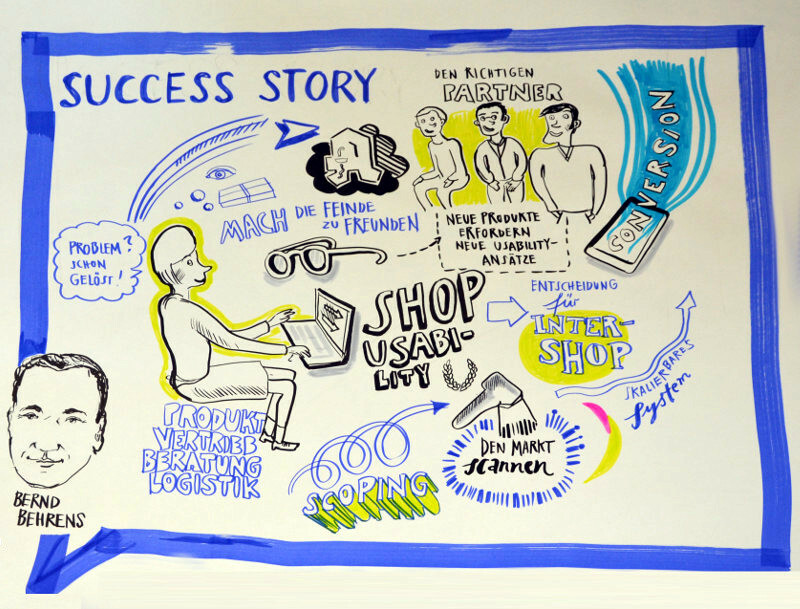 Figures never lie: eleven sessions deepened the most trending digital-commerce topics, around 200 tweets generated a successful online exchange and four strong sponsor players: Adobe, FACT-Finder, ShopLupe andTrusted Shops. Let’s dive deeper into the conference’s topics, giving you an overview about the key trends of business success in digital commerce. Framing the Conference – Customer first! dotSource’s founders and general Managers Christian Malik and Christian Grötsch framed the conference. In his opening keynote Christian Malik gave a brief introduction about the processes behind digitisation and digital transformation. He underlined the increase of connected digital technology changing the way people and societies think and act. It’s no exaggeration when he tags the era we live in as the „digital revolution“. The data produced in the past two decades and the amount of digital devices predicted for 2025, including billions of sensors, accelerate the change of our habits and expectations. What’s needed is a shift in business models, focusing on customer relation and communication. User experience, agile methods and adapting to trends is what Christian Malik identified as the main challenges for business success in the future. That’s where Christian Grötsch completed the picture in the conference’s final keynote. Behavioural changes and unconventional customer expectations triggered by smart devices and convenient services force businesses to develop instant commerce strategies. Even if your product or your offering is the best in competition your ability to fulfil at the right place at the right time is becoming crucial for success. The timeframe between shopping and using a product is expected as small as possible by most customers. In order to do so, brands need to align all processes and think big. Progress is not an option – it’s becoming a necessity. A vital exchange with commerce experts is a valuable inspiration for most business deciders. However, it’s often hard to integrate the general findings and strategy proposals into the own business reality. Here’s where Bernd Behrens from 4CARE and Phillip Harm from WÜRTH shared hands-on insights with the audience. Both speakers proposed to stop differentiating between B2B and B2C in the first place. Instead, B2P – Business to People, in their opinion is the future’s claim. Sure, B2B and B2C often have different priorities, but the potential to learn from one another is incredibly high, for example when thinking about same-day-delivery, cross-channel strategies, and a convenient customer experience. They had even more topics in common, so let’s focus on the ones having the strongest business impact. Firstly, 4CARE’s Bernd Behrens showed how mobile usability improvements increased conversion rates and revenues. WÜRTHs Phillip Harm promoted a user-centric shopping experience as well. If you don’t know when and how your customers shop your products, usability improvements can only be created via trial and error. Decreasing cost and increasing revenue can only be achieved by a strong customer-first approach. Secondly, both promoted to choose technology from an ability to experiment perspective. Rolling out new brands, products, or services needs to be easy because it enables businesses to test new ideas at low cost and increases learning speed. Bernd Behrens and Phillip Harm highlighted the importance of gaining and sharing knowledge in the whole organization. The different business units and departments of a brand need to work together closely. They agreed that it’s necessary to „connect the disconnected“ in order to drive nowadays’ change. Johannes Altmann from Shoplupe opened the session part of the day with his speech „Du bist, wo du kaufst!“ focusing on the paradoxal customer whose unique lifestyle allows him to care about his body condition riding a €8000 e-bike while consuming junk-food during work. Subtle differences are what successful retailers need to focus on when it comes to personalized offerings. Trust is becoming the new currency in commerce, taking into account the social and emotional components of a purchase and the importance of a customer’s lifestyle that’s connected to the probability of recommending a store, shop, or brand. Six further experts were invited to share their insights during two sessions the attendees could choose from. The variety of topics was chosen to inform and inspire. By this time, it was clear that customers nowadays are both: challenge and chance for business success. Digital brands need to keep an eye on a convenient shopping experience along the whole customer journey. 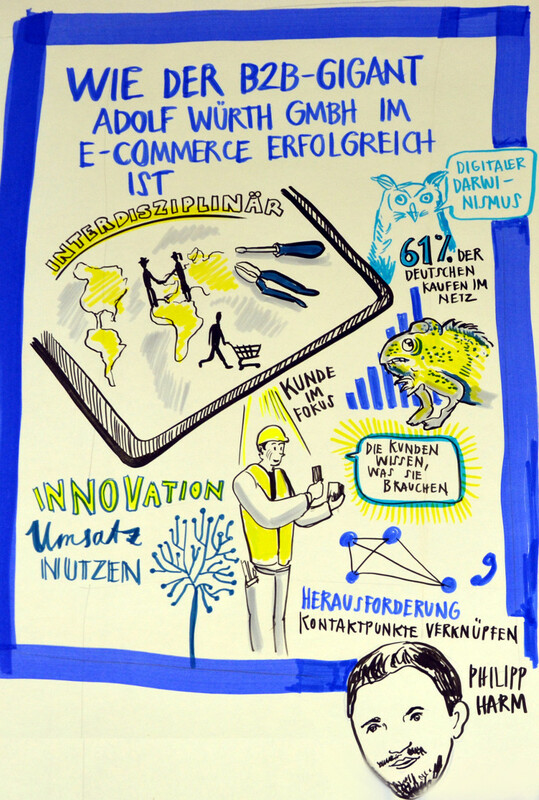 The session-speakers impressively showed what options and helpful tools online vendors can individually choose from to create AMAZON-like customer service and growth-rates, which are benchmark for digital brands (Adrian Hotz – A. Hotz E-Commerce Beratung). 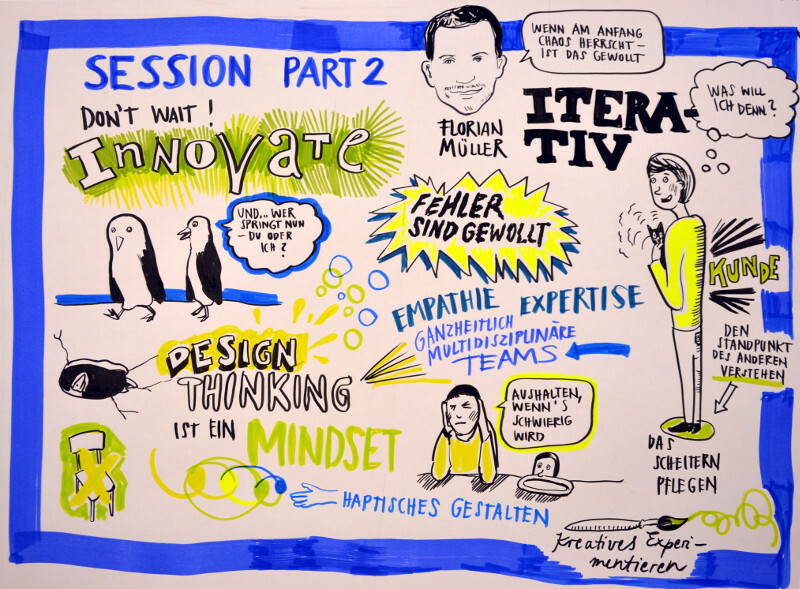 The first step is an innovation mindset (Florian Müller – projectUP!). If you’re willing to align your business processes to the customer in the first place, then tools can help you improve in the second. How they specifically do so, utilizing customer data and automation for a personalized shopping experience, Timo Kohlberg from ADOBE, Daniel Planert from FACT-FINDER, and Jan Lippert from PRUDSYS introduced during their sessions. Meanwhile, Oliver Dahms (Dahms solutions) focused on returns, many customer journeys’ other end, showing why integrating this costly aspect into business process design from the beginning can decrease cost and improve service significantly. 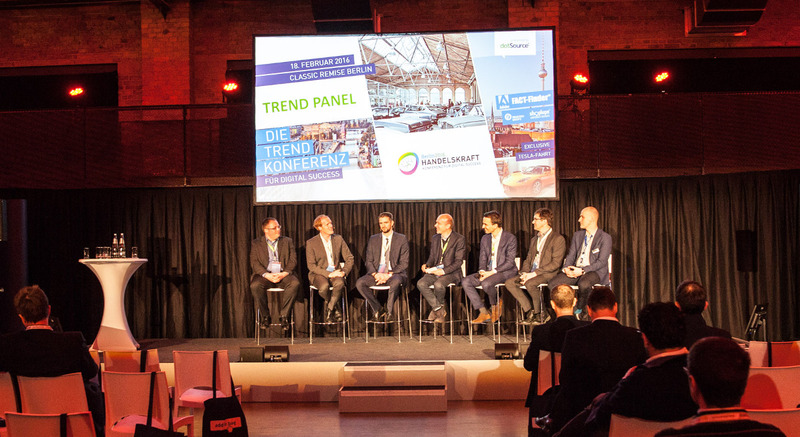 The conference’s final agenda point before the networking party was the Handelskraft trend panel. 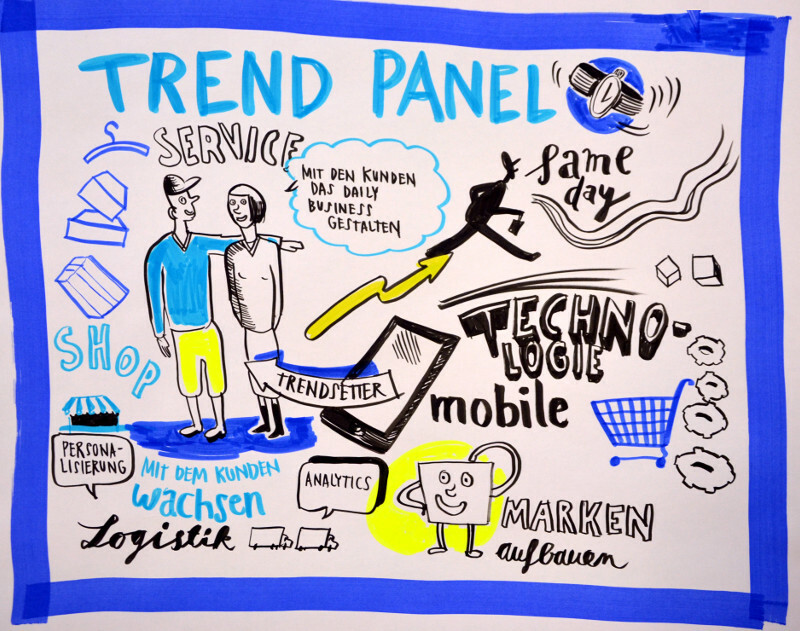 Hosted by K5 founder and well-known commerce expert Jochen Krisch, the guests Daniel Planert (Fact-Finder), Christian Grötsch (dotSource), Oliver Dahms (Dahms solutions), Johannes Altmann (Shoplupe), Adrian Hotz (A. Hotz E-Commerce Beratung), and Phillip Harm (WÜRTH) were expected to compete their perspectives and to identify their personal commerce trends. Surprisingly, the debate was a showcase of joint forces rather than a fight, but this fact was highly appreciated by the conference attendees. 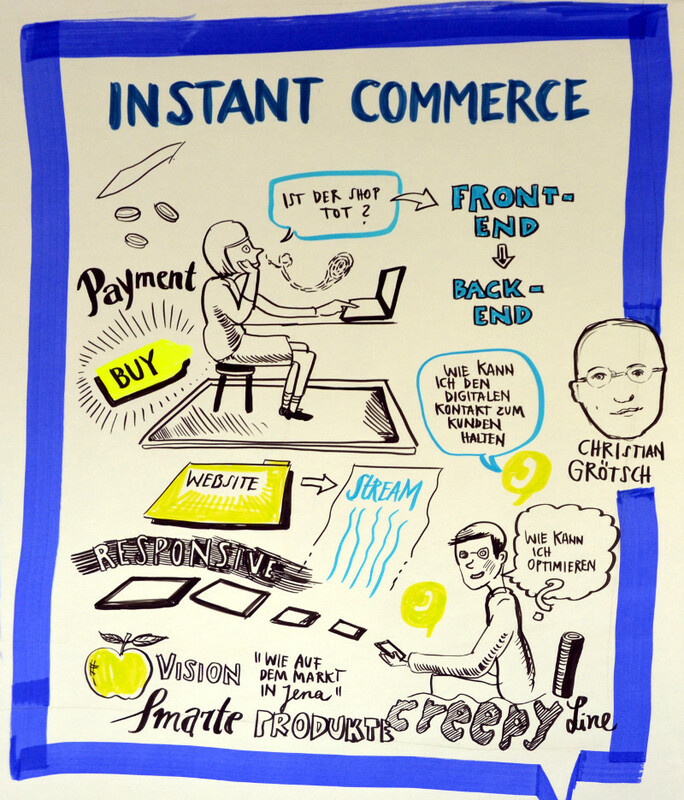 In a nutshell: The time of everlasting commerce knowledge is over! Customers and businesses identify themselves and differ by subtle differences, but keep belonging to bigger groups and systems. Therefore, collaboration and permanent evaluation of the own activities is today’s state-of-the-art strategy. You need to think big like Amazon but do small steps fast. To do so businesses and customers rely on trust and partnerships on eye level that meet expectations during the whole customer journey from attractive offerings to satisfying fulfilment to easy returns. The digital revolution changes our habits and the way we think, democratizing access and participation focusing on best practice learning and innovation. We would like to say thank you to our sponsors & partners, the Classic Remise Berlin, Eventtool24, our Graphic Recorder Anne Lehmann , the film-Team from filmreif.biz, all speakers and experts, all attendees & guests and all people we forgot who helped to make this great conference becoming reality. 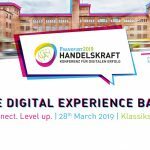 We hope the Handelskraft Conference 2016 was as attractive and inspirational as you expected so that you could take the best hints to face the big challenges of tomorrow. 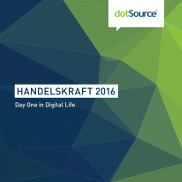 A broader, more dedicated and richer picture about the main trends discussed can be found in our Trend Book “Handelskraft 2016: Day one in Digital Life’, which can be downloaded here (in German). Keep full of energy because the exciting trip towards digital success continues with the breakfast series. Next stop: 15th of April in Dusseldorf. Registration is now available here! Save the date and do not miss out on one of the most innovative events within the digital sphere this spring!